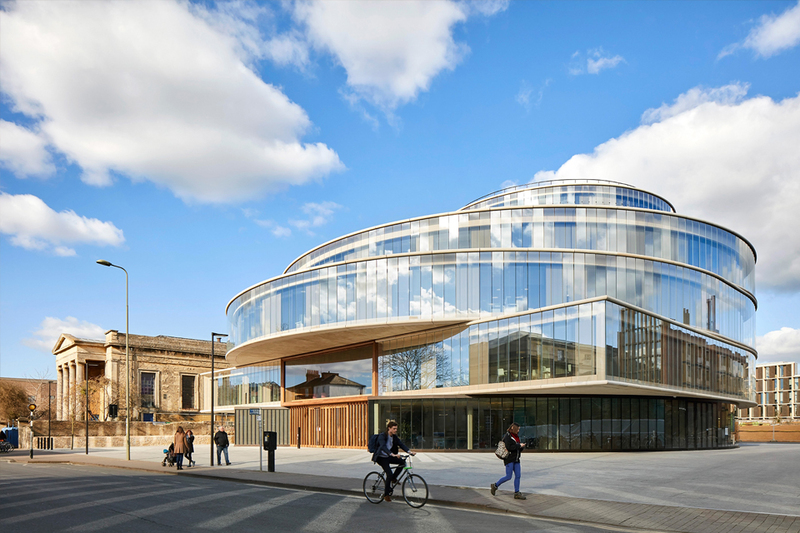 On a prominent site directly opposite the neoclassical Oxford University Press, it rises as a stack of five glass drums framed in bands of honey-coloured concrete. These drums are all of different shapes, which creates a series of overhangs, setbacks and terraces. The circular ground floor is topped by a larger horseshoe-shaped volume with a flat facade and a showy “window on the world” – the largest piece of double-glazed plate glass in Europe. Above this, a stretched oval bulges out over the entrance, before the plan reverts to a smaller circle. Only the rotunda-like top two floors stack neatly one on top of the other, even as they push the building up to 22m – 4m above the accepted limit for additions to central Oxford’s skyline. Despite this apparent ostentation, the other striking thing about the School of Government is how well it fits into its context. The rectilinear first-floor facade is a deliberate continuation of the line of the portico of the Greek Revival church next door, and the building tactfully steps back from the main road as it rises. Even the bull-nosed precast-concrete sills and lintels, which support a double-skinned frameless facade, are apparently a reference to the stone architraves on Wren’s Sheldonian Theatre a few streets away. On entering the building a sweeping staircase of in-situ concrete draws you down to a basement-level “forum”, a space for students to mix and stage events. To look up from here is a slightly dizzying experience. An atrium spirals up the full height of the building, shifting at each level with the irregular plan. The floorplates, wrapped in concrete balustrades, seem to float above the forum, thanks to cantilevers up to 9m deep. Coupled with the curving staircase down to the basement, as well as a separate in-situ concrete spiral staircase at the back of the forum, the effect is of unspooling tape. 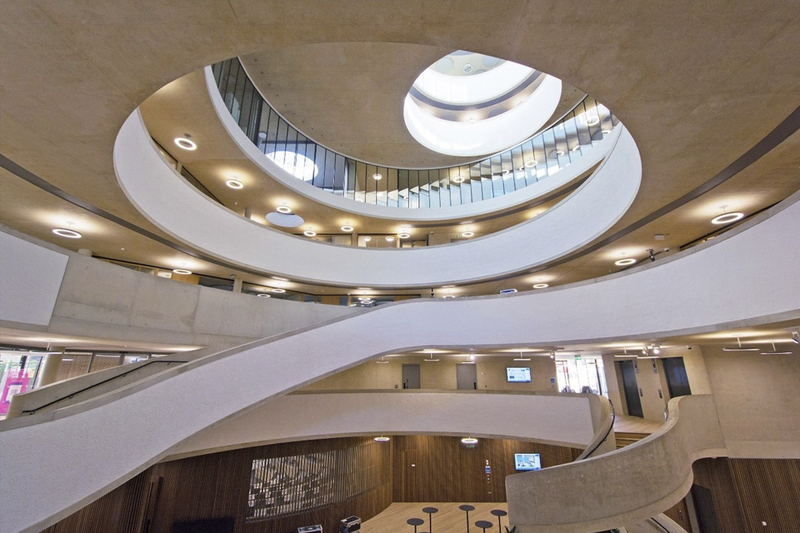 This also means you can get a sense of the building’s programme just by standing in the forum: from the ground-floor cafe, past the teaching rooms on the first floor, to the glazed academics’ offices on the second and third floors, and even up through the smaller opening in the fourth-floor slab to the common rooms above. 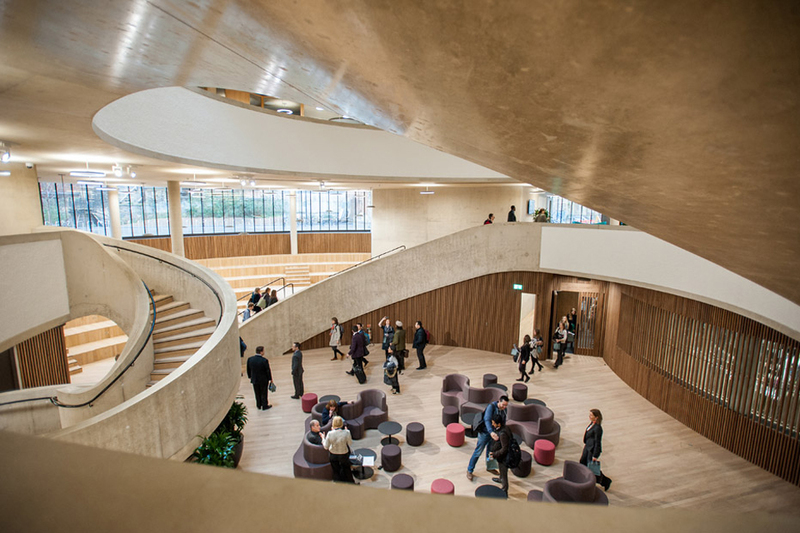 The materials, too, are both resonant of their context and defiantly modern, with oak panelling used in playful riposte to the university’s fusty senior common rooms, and walls, soffits and stairs in limestone-hued concrete. The contractor charged with realising the in-situ concrete was Laing O’Rourke. For a company well known for using off-site manufacture and precast elements wherever possible, this may have seemed a brave move. Not only did the structure appear to defy gravity, but the finishes had to be impeccable – with no scope for second chances. HdM is the sort of architect that likes to express the bones of a building, and doesn’t like its concrete to be made good afterwards to hide marks and blowholes. For HdM and Expanded, this meant embarking on an exhaustive testing process with concrete supplier Tarmac. The challenge was compounded not only by the amount of reinforcement demanded by the complex structure, but also the quantity of M&E that had to be cast in. The workability of the concrete was therefore critical. The team eventually decided on a high-flow mix with 40% GGBS cement replacement and an added plasticiser. They then cast an exact replica of a two-storey section of wall and, just to be on the safe side, decided to cast all of the concrete to the same high specification, whether it was visible or not. This meant that the plant rooms on the lower basement level could be treated as a final test run. The result is an impressive exposed finish. The lightening effect of the GGBS has drawn out the honeyish tone of the local limestone aggregate. The soffits are seamless expanses, with the services rising discreetly up through the oak flooring. And the colour is consistent throughout the interior, thanks largely to a contract that insisted the same quarry be used for the whole project. 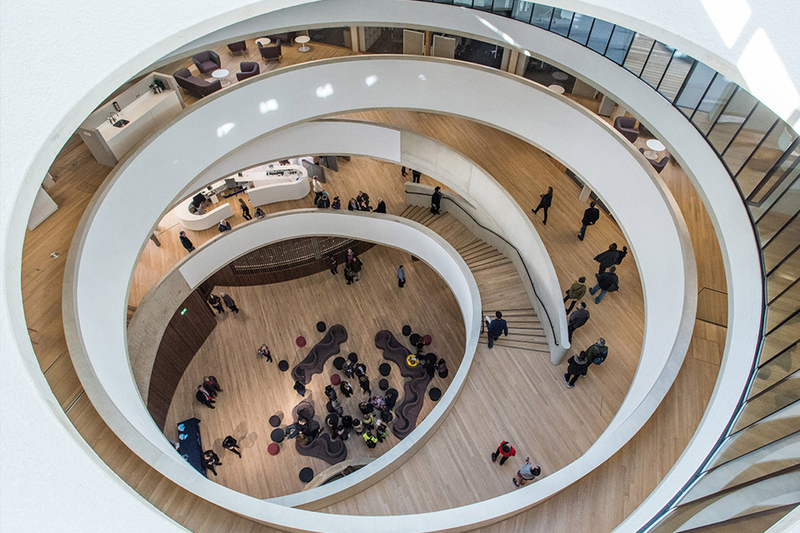 The real highlights though are the two sculptural spiral staircases – the one rising up from the forum to the ground floor, and another connecting the upper levels above the rear entrance (pictured on the previous spread). The first twists almost organically in two planes, an effect that required meticulous setting out. The moulds were designed in 3D by Loughborough-based Patterns and Moulds, and this model was then used to make the formwork on site, as the shapes simply could not be expressed in 2D drawings. It's well worth the climb up to the fourth floor too. Here, you can pass through the rotunda to a large terrace that enjoys a rare view of Oxford. Perpendicular to the High Street, the dreaming spires are laid out as if in a line. It is a vivid reminder that this bold statement of Oxford’s future never loses sight of its past. Text taken from 'Dreaming Spirals' article, (page 4) Concrete Quarterly, summer 2016.